Prospects today want to know that people or organizations just like them are solving similar challenges with your products and services. You need example stories in your back pocket for. . . Happy Friday! Nearly every business has happy customers, but often they don’t know how to truly leverage that asset – beyond just creating a success story or case study. Lindsay. . .
For many companies, the biggest challenge in creating customer case studies and success stories is getting customers to agree to be featured. I’ve often found the customer’s PR team is. 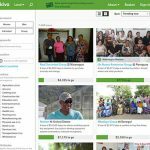 . .
About a year ago, I learned about Kiva.org, a nonprofit that facilitates micro-lending for entrepreneurs in the developing world. Kiva empowers businesses and individuals to loan money in increments as. . . I just read David Meerman Scott’s The New Rules of Marketing & PR. It provides a valuable blueprint for developing your own content marketing strategy. Scott makes an important point. . .